Enjoy the fun activities, attractions, events and things to do in Johnson City. Check the Chamber Calendar for current schedule of local events. ART GALLERIES: This small town has a plethora of artists and galleries for your enjoyment. Be sure to visit the A Smith Gallery, LMC Mural Gallery, Kathleen Marie Studio, Kirchman Gallery, Zena Stetka Howe, Copper Roof Art Studio, and more. For more detailed listings, see Galleries, and nearby Arts. 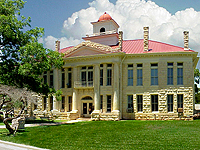 BLANCO COUNTY COURTHOUSE: Still in service, this beautiful courthouse contains government offices and historical displays. On the Courthouse Square, of course. 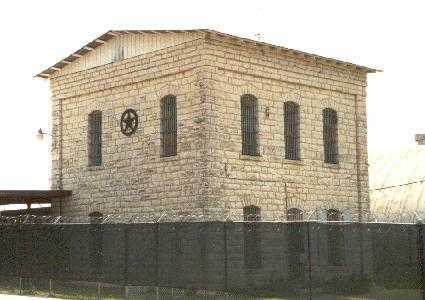 BLANCO COUNTY JAIL: See this historic facility, no longer in active use. Located next to Memorial Town Park, on Ave G just across from the Courthouse and a half block from US-290. Completed in 1894, built of limestone by J.E.L. Dildine, a rock mason from Kansas. A record of only one jail outbreak, in 1897. 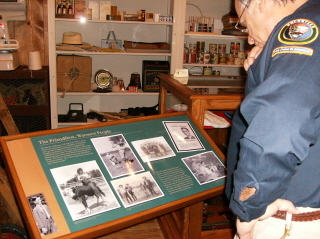 CAPTAIN PERRY TEXAS RANGER MUSEUM: 830-868-7111; Managed by City of Johnson City, and temporarily closed. Learn more here! EXOTIC RESORT ZOO: 830-868-4357; Located just north of Johnson City on US-281. JOHNSON CITY HIKING TRAIL: 830-868-7111. This 1.8 mile round trip hiking trail meanders from the Johnson City Community Park, past the Courthouse Square to the LBJ Park Visitor Center. You can extend the hike on both ends by walking through the parks and sidewalks. Walking and roller skates only, no bicycles or skate boards. Water fountain and memorial park benches along the way. Not yet lighted at night. JOHNSON CITY MEMORIAL PARK: 830-868-7111. 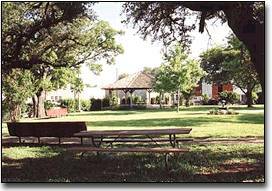 A beautiful small park in the center of town on Main Street (US-290 at Ave G), with large oak trees, gazebo, picnic tables, park benches, a memorial, and public bathrooms. Site of music events, festivals and weddings. Specially decorated for many holidays. JOHNSON CITY SWIMMING POOL, PAVILION & PARK: 830-868-7111. Private parties, swimming lessons and water aerobics available. Tennis courts, ball fields and pavilion. JOHNSON CITY WATER SPORTS AREA: Located on the Pedernales River at the Bridge on US-281 just N of town and next to the Blanco County Show Barn. Easy launching area. Ideal for kayaking, canoeing, picnicking and fishing. Convenient parking at the launch area. No lifeguards. There is no charge for use of the water area or parking. Enjoy. 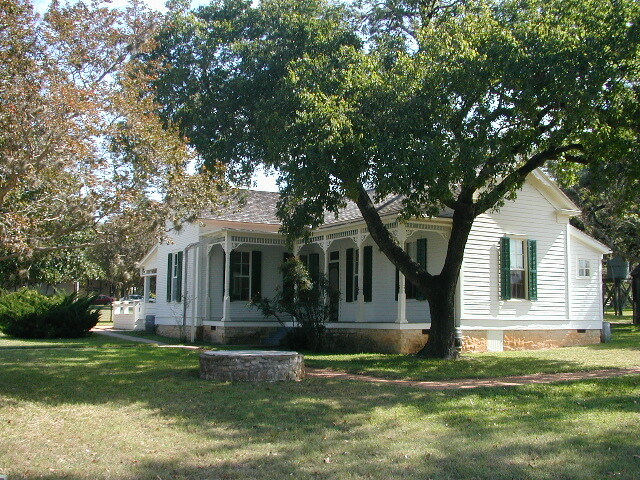 Attractions at this very popular park include: NPS HQ & Visitors Center with LBJ period videos, Book/Gift Store & LBJ Memorabilia; Park Meeting/Event Center; LBJ Boyhood Home, Johnson Settlement; and NPS Park Facility with horses, cattle and historical markers. Click Map (requires Adobe Reader). Also see Parks & Lakes for more details. 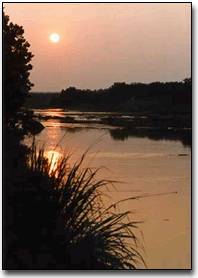 PEDERNALES RIVER NATURE PARK: Owned and managed by LCRA, this 222 acre river-front park is located right in Johnson City. Offers public recreational day use, including fishing and picnicking. Plans are underway for more extensive development of outdoor facilities and activities. During this interim period, LCRA access and facility use fees are temporarily waived. See www.lcra.org/pedernalesnaturepark. On east side of US-281 at the Pedernales river bridge. Entrance just south of Town Creek and a few block N of the US-281/290 intersection. NEARBY: LYNDON B. JOHNSON NATIONAL HISTORICAL PARK - STONEWALL: Located just 11 miles west of town, in Stonewall. This home of LBJ and Lady Bird is the "Texas White House" famously used during his presidency and showcased to the world with US and international leaders from the world visiting their ranch. See Parks & Lakes for more details. 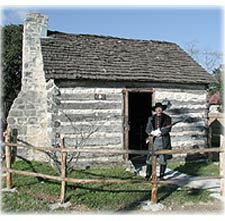 NEARBY: LBJ STATE PARK & HISTORICAL SITE: 830-644-2420; Also in Stonewall, this state park has many resources to offer, including a visitor center, exhibits, pool, pavilion, the Sauer-Bechman Living History Ranch, and much more. 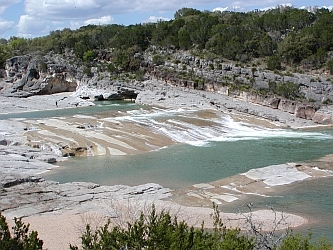 (LBJ State Park). WHITTINGTON'S: 830-868-5500; Maker of the best beef and turkey Jerky in the Hill Country. Only Texas food products. All of their Jerky is made right here in Johnson City, using only the finest of meats and following their 40 plus year old family recipe. Retail and wholesale. Since 1963, producing jerky at the factory next door to their General Store and gift shop. Store has samples of their jerky and salsas, a wide variety of gifts, jewelry, candles, knick knacks, spices, preserves, jelly, syrups, cobbler-in-a-jar, pickled foods, cold beverages, Texas wines by the bottle, made to order gift baskets, and more. 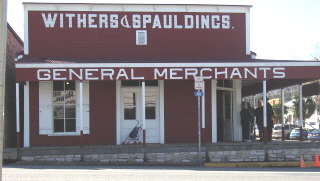 Located on south end of town on US-281. www.whittingtonsjerky.com. WILDFLOWER TRAILS: Johnson City is the "Wildflower Capital of the Texas Hill Country", and the scenic roads in and around JC in the springtime are often emblazoned with the colors of bluebonnets, painted brush, Indian paintbrush, phlox, Mexican poppy, winecups, Indian blanket and lemon mint along the roadsides and in the fields. The annual Wildflower Festival (flower displays, live music, contests, and vendors aplenty) plays tribute to the enticing splendor of natural beauty for which this area is known. A must see and makes for great weekend adventures! Also, don't miss the nearby Willow City Wildflower Loop. A perfect day in . .